Front-wheel drive vs four-wheel drive – which is more thrilling? The two have a combined power output of 670hp! The hot hatchback war that's been raging since the very first 110hp Volkswgen Golf GTI went on sale in the UK in 1979 shows no sign of abating. A decade ago, 200hp provided leading-edge performance – but today, that amount of power doesn't get you close to the sharp end of the grid. The 2017 Honda Civic Type R boasts 320hp, which is delivered efficiently through its front wheels. But that pales beside the four-wheel drive Ford Focus RS. Launched in 2016 with 350hp, it can also be stacked up to 375hp thanks to the option of a Mountune tuning kit. If that's not enough, there's a 400hp option for real thrill-seekers. It also comes with masses of excitement thanks to track and drift modes. We can’t talk about why we love the Focus RS so much without betraying a journalistic principle and sticking some numbers in the first few paragraphs. Because this fast Ford, like all before it, offers a huge amount of performance for a relatively low price tag. In fact it’s such good value it won our Cheap Fast Car group test, with each of its 350 horses costing just £92.19 – far less than anything else we drove. For context the Focus competes more naturally against the Mercedes-AMG A 45 and Audi RS 3 – cars that cost £10,000 and £15,000 more. So it wins your head before you even turn a wheel, at which point it goes about winning your heart too. With all that power and all-wheel drive you could be forgiven for assuming it is a fast but two-dimensional car to drive, however nothing could be further from the truth. 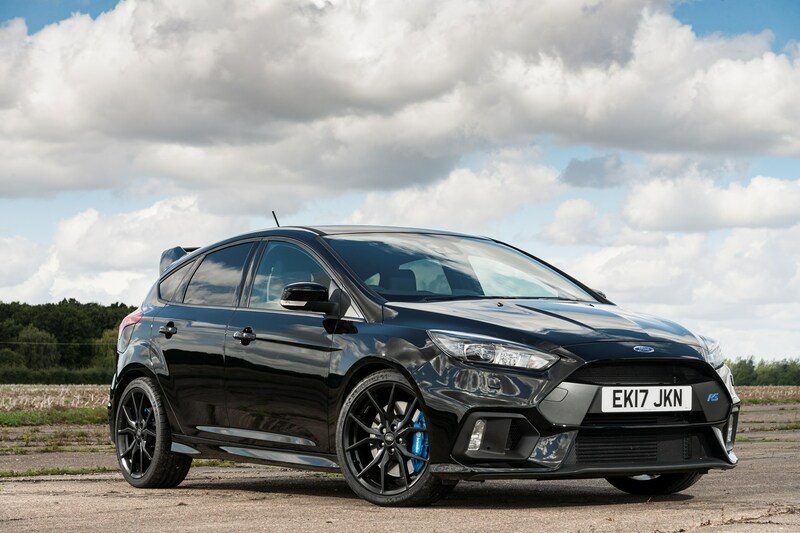 While competitors feel like their wheels are stuck to the tarmac, the Focus RS seems alive and constantly on its tip-toes, with a chassis that requires a finely balanced steering and throttle to get the most out of it. More like a rear-wheel drive car in nature, it’s a much more rewarding steer because it actually feels like you’re driving it, not the other way around. In reality though the Ford is just as grippy as its German rivals, and can shift its power around each of the four wheels individually to ensure you stay pointed in the right direction. It even excels in unquantifiable areas, like the noise that blares from its exhaust pipes. 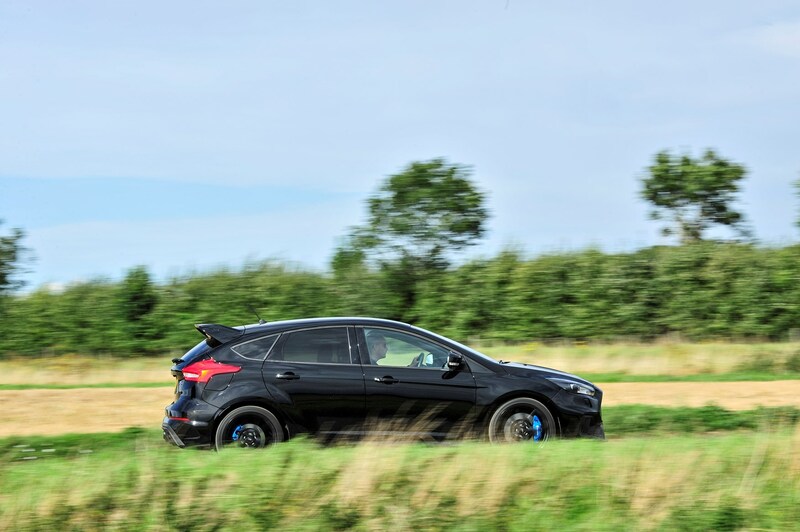 There’s no boring four-cylinder drone here – the Focus sounds raw and rally-car like with a metallic rasp and machine-gun chatter after a full-throttle lift. There are some drawbacks – the interior looks pretty old now, the seating position with the optional buckets is too high (although there is a kit to fix this now), and the ride is uncompromisingly firm, but these are minor points in an otherwise fantastic car. We challenge you to care about dashboard plastics after ten minutes on a country road. 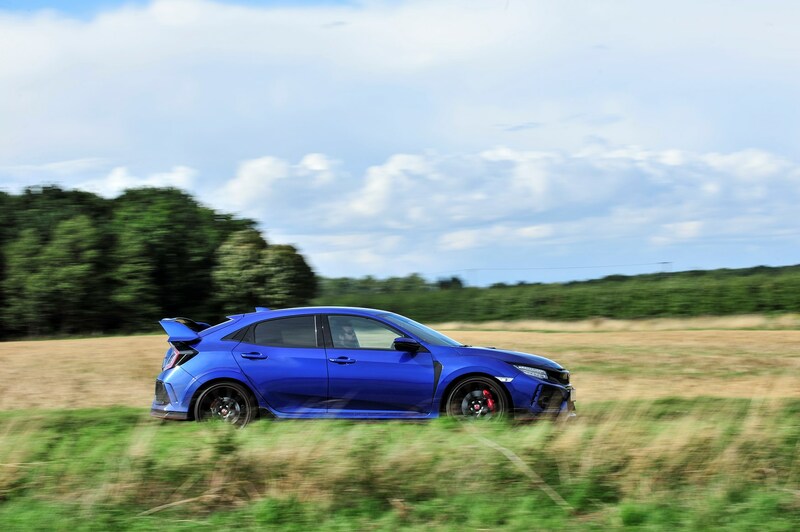 The Honda Civic Type R is hugely commendable in terms of single-mindedness and its pointy front-end, but if you prefer a car with a sense of humour that can corner hard in a downpour then the Focus RS is the better choice. The Honda Civic Type R is also a car that we can't get enough of. It's fair to say that in terms of outright brutish performance, it lags a little behind the Ford Focus RS. But for those looking for thrills, spills and an engaging on-road experience, it's up there among the best of the Type R back catalogue that so enthuses Honda fans across the globe. 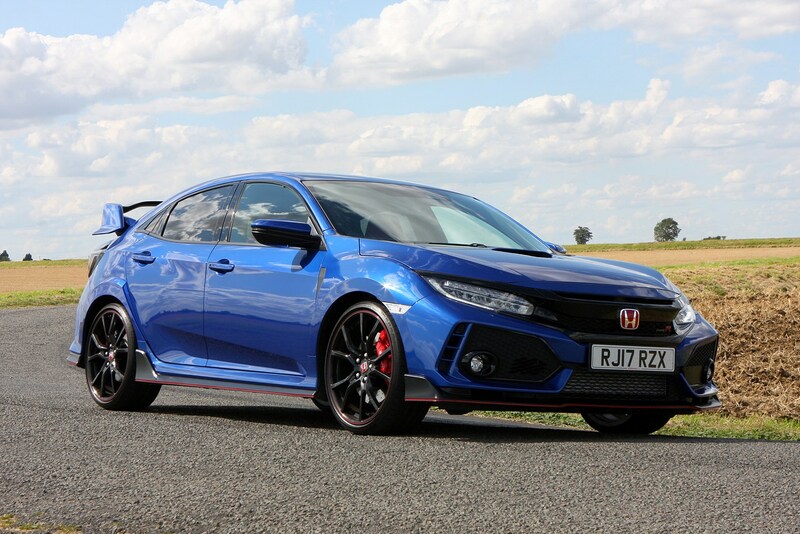 Where the Ford Focus RS smashes your senses by constantly reminding you about its massive performance, the Honda is a little more subtle in how it goes about its business (to drive, not to look at). For a start, you can put it in Comfort mode, which backs off the suspension from circuit-grade stiff to just about acceptable on UK roads. Compared with the Focus, though, in Comfort mode, it's beautifully damped for day-to-day driving. That makes it seriously usable, and not just an uncompromising weekend-only play thing. As a hot hatch, the Civic is as good as you'll hope it will be. The throttle response is sharp, and power delivery is near-instant from low revs. There's almost no lag – you plant your right foot and it goes hard. So much so, that you'll swear it's powered by a big, normally-aspirated engine instead of a turbocharged one. As for performance – alongside just about any rival (aside from the Focus), it isn't disappointing. It sprints from from 0-62mph in 5.7sec and tops out at 169mph. On the autobahn it feels absurdly fast. On UK roads, it always feels well within its capabilities – so much so that you might question why you've chosen this version. 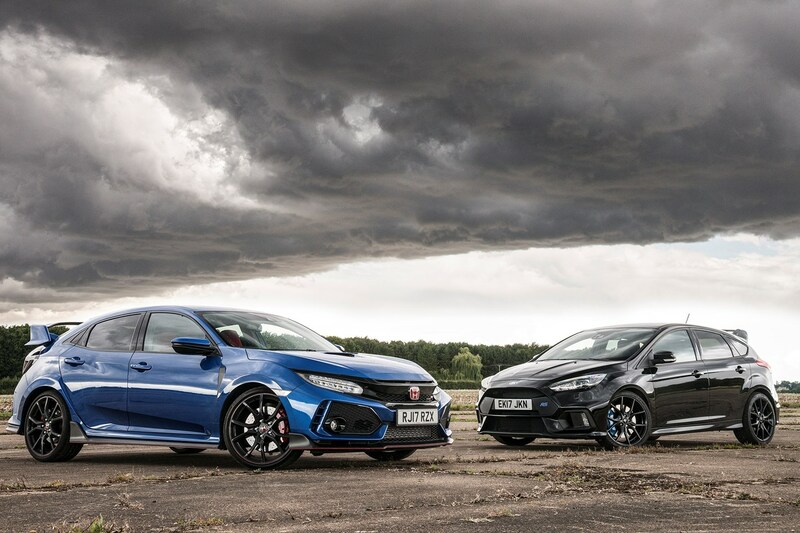 So – which is it to be: Honda Civic Type R or Ford Focus RS? Both of these cars are brilliant hot hatches – and you're going to have a blast, which ever way you decide. The Honda is great fun, and right now, just about the best front-wheel drive performance car you can buy. But alongside the Focus, it's ever so slightly anti-climactic. It's not quite fast enough to bait supercars (which is what you want in a hot hatch), and its styling and interior are just a little bit more challenging. If you like the way it looks, you're already sold. No, the Focus wins through in this twin test. There's more drama, fizz and sheer old-fashioned ability to deliver thrills and spills on demand. Yes, it has flaws, but the upsides are so compelling, you'll forgive the Focus RS for just about anything.